Ella's Kitchen Apples + Bananas Stage 1 from 4 Months 90g. 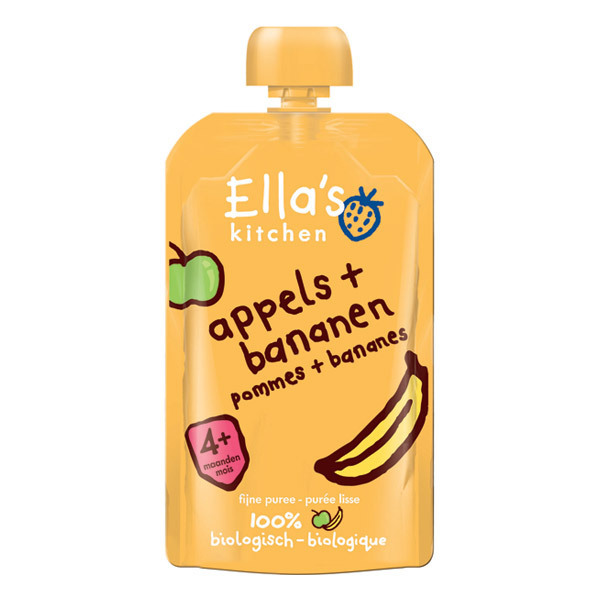 A yummy mix of pureed apples & bananas for tiny eaters to enjoy! Packed into a handy resealable pouch. Stage 1, from 4 months. 90g. Storage: To be kept in a cupboard up to 12 months. Once opened, keep in the fridge for up to 48 hours. Can be frozen. The cap could be a choking hazard to children under 36 months. Always keep out of their reach! Ella's Kitchen makes tasty, natural and healthy organic food for kids & babies, in handy packs for parents to use wherever they want! Ella's Kitchen believes that organic food products are more nutritious and guaranteed to contain no chemicals or pesticides. From the beginning, the company has worked closely with lots of experts such as nutritionists, retailers, manufacturers and other organic baby food experts. But most of all, they have listened to real parents and real kids needs. The British company tries to be as environmentally & socially responsible as possible. As well as helping little ones to grow up, everyone at Ella's Kitchen want to do a bit to look after the planet we live on and to give something back to kids around the world.